Reserve du Patron Semois in a Kaywoodie Billiard. Almost a quarter of the way through this bowl of McClelland No. 25 in a 1980 Stanwell 668 medium bend with a multi-colored ferrule, half black sandblasted, half brown smooth, rough top with a black vulcanite stem. Have enough for one more bowl. Simply Apple is my drink. Penzance in a cob. Actually I wouldn't smoke that garbage in that garbage. Dunhill Flake in a Ryan Alden Blasted Lumberman. 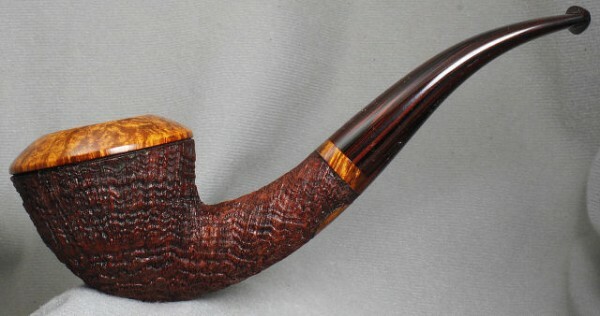 Pease Quiet Nights in a Jesse Jones small elephant's foot and Ye Olde Signe in a quarter bent Tonni Nielson freehand. Now smoking Edward G. Robinson's Pipe Blend in a 2014 Basil Meadows smooth slight bend squashed tomato with an aluminum band and a black pearl acrylic stem. Dunhill Dark Flake in a Stanwell 95. Almost finished smoking Jim's Half Va., Half Burley w/Per in a 2003 medium bent straight grain Two dot 2 P. Ardor Venere Extra Bucaneve with a silver ferrule signed by Dorelio Rovera and a black acrylic stem. Then, it's lunch time. 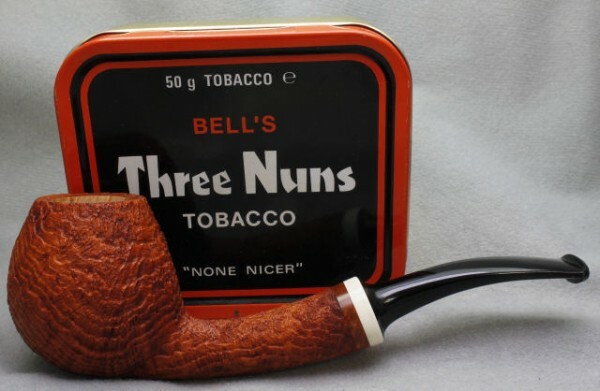 Packed for later, after an Easter feast, C&D Bayou Night in a smooth bent Bari billiard; Bari is a good quality Danish factory pipe, now discontinued, gifted to me by my late wife's aunt many many Christmases ago. Meantime, eventually, roast lamb, asparagus, cooked tomatoes, and for dessert, creme brule. GHCo Scotch Mixture in a Savinelli 111KS. Now smoking Director’s Cut in a smooth straight early 1960s Lane era Charatan Executive Extra Large stretch apple with diagonal channel cuts on the lower right and left of the bowl along with a black vulcanite double comfort stem. This pipe was formerly owned by actor William Conrad. A bottle of Cheerwine made with pure cane sugar is my drink. Warm and sunny here. Dunhill Nightcap in a BBB 722s Chelsea diplomat. Listing this a few minutes early: C&D Bluegrass in a medium bend raw sienna toned early Radice sandblast egg with bamboo carving on the shank and a black acrylic stem. Hyde Park in the beater pipe. Savinelli Doblone d'Oro in a no-name meer. Halfway through a bowl of Butera Royal Vintage: Dark Stoved in a Larrysson Dublin. 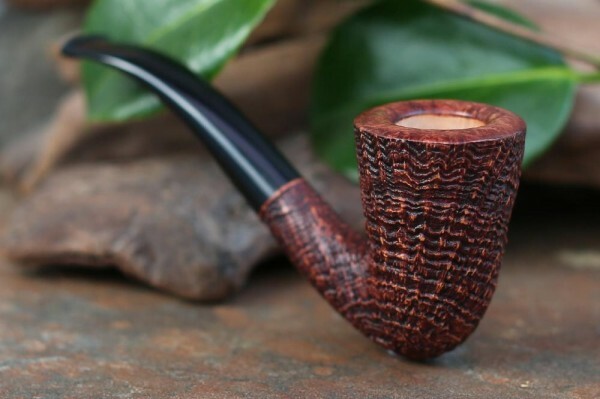 Peterson's Irish Flake in a Stanwell 139 slightly bent blasted billiard with army mount. 2008 Escudo in a Jose Rubio Billiard. Now smoking Esoterica Dorchester in a rusticated Peterson donegal rocky bent bulldog with a diagonal band and vulcanite p-lip stem. Just finished smoking Old Dark Fired in a smooth briar calabash shape 1984 Fero Danese made in Italy with a black vulcanite stem. Ice water and bergs is my drink. Having a quick smoke before dinner: D&R Two Timer Gold in a smooth full bend 1977 Crown Coachman 215 egg with a black vulcanite stem. Having a not-so-quick smoke after dinner. Stanwell 185 jammed full of Russ O's SV23 VaPer. 6yr. old PS/LBF in a no-name meer. Missouri Meerschaum Country Gentleman in a straight Missouri Meerschaum Country Gentleman. Happy Easter! Relaxing after a wonderful steak and mashed potatoes dinner with a bowl of McCranie’s 1983 Red Ribbon in an unbranded '70s Charatan smooth straight Billiard with a black vulcanite stem. My last pipe of the day is 2010 Samuel Gawith Full Virginia Flake in a sandblasted Brebbia Ninja squashed tomato a tortoise shell acrylic stem. Now smoking Skandivanik Regular in a 2015 smooth unfinished Savinelli 320KS author with a black vulcanite stem. Watching the Dodgers leading the Giants 1-0 in the 6th. Now smoking Art’s Virginia in a 1984 three quarter bend medium brown Ascorti KS Business Dublin with a black acrylic stem. Half way through this bowl of year 1936 Briggs Mixture in a 1977 straight black rusticated Sir Brent billiard with a silver band repair and a brown pearl grey acrylic stem. Just finished work and fed the cats, too. Just finished smoking Angler's Dream in a slight bend 1984 Stanwell Antique 124 grain etched with a smooth front with a black vulcanite stem. Last smoke of the day is Sutliff J4 Burley in a 2013 straight MM Missouri Pride Legend with a black stem. Doing some research on Ellery Queen. My last smoke was yesterday midnight. Indonesian local blend called "Heritage Blend" - Dark Fire Cured Series in bent venini pipe. Rattray's Marlin Flake in a Stanwell 51 billiard. This warm Easter weekend was a good one for enjoying some really good smokes. Had all three from the Stokkebye Luxury flake range, and a good mix of other European Virginia and Burley blends. As the weather starts to cool in Aus, I'll gravitate towards Pease English blends..
My first pipe of the day was C&D Habana Daydream in a Peterson Aran billiard. I’m now smoking Sam’s Mixture in a Missouri Meerschaum bent Legend cob. 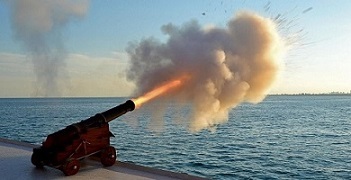 I mixed D&R Windsail with C&D Dark Fired Kentucky. I placed said blend in a ziplock bag, stuck it under the bed for a few weeks, and voila. It’s actually not bad. 4yr. old Mac Baren Old Dark Fired in a no-name meer. Savinelli Doblones D'Oro in a Mark Twain Cob. 2010 PS Proper English in a Ferndown *** Bark. Amazing how well this inexpensive bulk has aged. Glad I cellared a few lbs. back then. Ennerdale Flake in a JZP morta Uke. Just finished smoking Edward G. Robinson's Pipe Blend in a 2014 Basil Meadows smooth slight bend squashed tomato with an aluminum band and a black pearl acrylic stem. 2015 Wessex Gold Slice in a Rad Davis Brandy. Half way through this bowl of 2011 Villiger Virginia No. 444 in a three quarter bend smooth 1985 Dunhill Chestnut 5202 billiard with a cumberland stem. Glad to revisit this blend, and I see age has helped it mature nicely. A bottle of Stewart's Root Beer made with pure cane sugar is my drink. McLelland Dark Navy Flake from 2007 in a Nording bent Rhodesian. Rattray's Brown Clunee in a no-name meer.